The lived a normal life … until the Joneses moved in. If I had to choose one word to describe Keeping Up with the Joneses, it would probably be ‘safe.’ The word ‘safe,’ however, doesn’t really spell success for a comedy film — the best usually standing up to repeated viewings — as those with very little pulse often end up being swallowed by today’s overcrowded market. Sadly, Greg Mottola’s first feature in five years — 2011’s sci-fi farce Paul being his last — is a by-the-numbers action-comedy which lacks the complexity and sophistication of his past work, Superbad (2007) and Adventureland (2009), along with the jovial chuckles. Featuring a strong ensemble cast, Keeping Up with the Joneses follows squeaky clean couple Jeff (Zach Galifianakis) and Karen (Isla Fisher) Gaffney, whom, for the first time in eleven years, find themselves confronted by a challenge that all parents must eventually face: an empty nest. With their kids away (on summer vacation), the Gaffneys can play, the pair hoping to reignite their somewhat diminishing romantic flame — cue the awkward hot and heavy dream sequence. This proves to be easier said than done when Karen is distracted by the sudden arrival of the new neighbors, the ultra-stylish Joneses, who join the suburban cul-de-sac. Tim Jones (Jon Hamm) is an accomplished travel writer armed with an arsenal of wild stories, and his drop-dead gorgeous and wife Natalie (Gal Gadot) is a social media consultant and a chic food vlogger, one who also aids Sri Lankan orphans. Yet, for Karen, something feels slightly off about the seemingly perfect Joneses, the bored housewife making it her mission to get to the bottom of her suspicions. Alas, when she discovers that the Joneses are international superspies investigating a treasonous deal, one that could be taking place at MBI — the local aerospace and defense plant, where Jeff works in Human Resources — the Gaffneys are thrust into the dangerous world of global espionage, the two families forced to work together in order to survive. 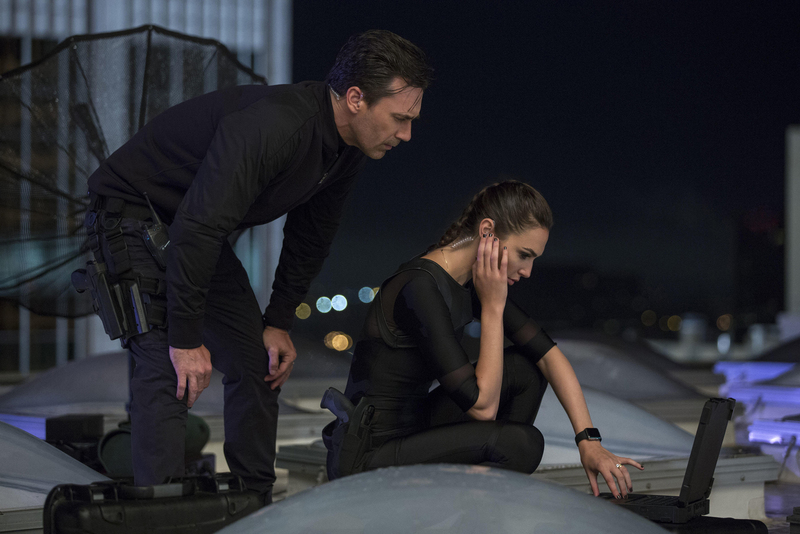 Taking its cues from Brangelina’s Mr. & Mrs. Smith (2005), which brought the A-list couple together, and Jackie Chan’s kid-friendly The Spy Next Door (2010), Keeping Up with the Joneses starts off slow but gets funnier the further it zips along (a comic highlight being a dig at the British), the derivative script by Michael LeSieur, You, Me and Dupree (2006), remaining disappointingly risk-free. Even so, the modestly budgeted action sequences are well handled by director Mottola, who seems restricted by a studio unwilling to take a few risks, its conventional nature keeping the flick from breaking out of its mold — think a tame sitcom-y version of Mr. & Mrs Smith. We have exaggerated car chases, indoor skydiving (? ), silly suburban pratfalls and a scene that sees Gal Gadot and Isla Fisher stripped down to their underwear — the latter arguably worth the price of admission. Even after 11 years of marriage, this wife still carries a torch for her husband. Even with all of its predictability, Keeping Up with the Joneses still manages to build a bouncy relationship between its two central couples, this part and parcel to its strong leads. Taking a refreshing break from his usual man-child shtick, Zach Galifianakis is great as the optimistic Jeff Gaffney — one of those guys who puts a positive spin on everyone and everything, even when he’s faced with real-life danger — The Hangover (2009) star finding a sturdy balance between goofiness and sincerity, illustrated best during a sequence where Jeff and Tim bond at a cobra-themed Asian restaurant while dining on a poisonous snake — well, that’s until Jeff is bitten by the still-breathing viper. Contrasting nicely with Galifianakis and his subdued nature is Isla Fisher, Now You See Me (2013), who depicts his nosy wife Karen, a freelance interior decorator who’s idea of fun is DVRing The Good Wife (2009), the striking redhead spending the majority of the flick’s 105 minute run-time snooping, screeching and screaming. Moving on to the Joneses, Jon Hamm from television’s Mad Men (2007) is both charmingly debonair and utterly hammy as Tim Jones, the 45-year-old embodying everything that movies have taught us about secret agents — this dude’s handsome, suave and a master of artillery — and although highly skilled, Mr. Jones still dreams of living the simple life, one that’s deception free. By his side is the ravishing Gal Gadot, Batman v Superman: Dawn of Justice (2016), who plays his stunning tough-as-nails wife Natalie, who’s ogled over by several folk at an annual cul-de-sac celebration known as Junetoberfest — Gadot clearly more comfortable dispensing action as opposed to comedy. Every couple needs a little action. Rounding out the cast is actor-comedian-Twitterer Patton Oswalt who breathes life into the Scorpion, a nerdy bad guy whose motivations are sketchy at best and Kevin Dunn, Transformers (2007) — who perhaps features in the flick’s strangest cameo — portraying MBI’s homeless head of security Carl, who’s randomly living in a caravan next to the plant because his wife divorced him and kicked him out of family home … weird. Afraid to take this cool premise anywhere new and exciting, this Desperate Housewives-esque cookie-cutter sees filmmaker Greg Mottola delivering his weakest picture to date. Concluding with a half-baked epilogue that transports the action to a crowded Marrakech setting, Keeping Up with the Joneses is a harmless lazy-Saturday-afternoon time killer, one that might play better on the small screen at home.